How would you like to be able to make your own music? Don’t you want to become the next Slash or Buckethead? Guitarists are some of the coolest people in the entire world. Aspiring to be a good guitar player is great and it is also a good hobby. Of course, you’ll first need to invest in a good guitar. An acoustic guitar for beginners is undoubtedly a good starting point. So, what do you need to think about when investing in a guitar? You’ll find out in this in-depth buying guide for the best acoustic guitar. First and foremost, you should understand that there are two types of acoustic guitars. It is possible to invest in a totally acoustic guitar or an acoustic electric guitar. A conventional acoustic guitar will not be able to connect to an amp, whereas the best acoustic electric guitar can. If you’re interested in saving money and you want to learn how to play, sticking with a conventional guitar is often best. If you want to play in front of crowds and wish to use sound effects, you should upgrade to an acoustic electric guitar. Really either option is acceptable. Therefore, you will need to choose the one that best suits your needs and preferences. Another thing to note is that acoustic guitars are available in many different styles. You can choose between classic, dreadnought, jumbo and more. You may believe that the style is only about appearance, but this couldn’t be further from the truth. In actuality, the style of the body can also impact the sound produced by the guitar. Below, you will learn more about the different body styles. Concert – Concert style guitars are very popular. They’ve been around since the United States Civil War. These guitars are capable of delivering a bright, trebly sound. These guitars aren’t nearly as common as they were in the past, but some people prefer them. Parlor – Parlor guitars are slender and small. They were very popular during the turn of the twentieth century. Parlor guitars are pretty rare, so you’ll probably need to special order one or order it online. Dreadnought – The first recognized dreadnought guitar was introduced in 1931. This is the most popular and common acoustic guitar style. If you want to play bluegrass, this is the guitar for you. Of course, dreadnought guitars are very versatile so they’re suitable for pretty much any music genre. Jumbo – As the name implies, jumbo guitars are very big. These guitars have plenty of resonant space, so they’re capable of producing a deep tone. These guitars are often referred to as the “cowboy” guitar. Again, it is impossible to make a wrong choice here. As long as you get the guitar that best suits your needs, you’ll be fine. Why Do The Prices Of Acoustic Guitars Vary? When you begin looking for the best blues acoustic guitar, you will quickly discover that the prices vary significantly. Many people do not understand this. What causes the prices of acoustic guitars to vary so much? There are many different factors that can impact the overall price. First and foremost, the manufacturing process will make an impact. If the guitar has been mass produced in a factory, you can guarantee that its price will be lower. If the guitar is handcrafted, you should expect to pay more. Also, where the guitar is made can make a difference. Guitars produced in the United States will usually cost a little more than guitars produced elsewhere. The type of wood used is also important. In reality, there are tons of factors that will change the price. Just remember that you should never feel obligated to spend more. Consider your options and your playing preferences. If you’re new to guitars, you shouldn’t spend so much. There are really tons of factors to consider when attempting to invest in an acoustic guitar. You’ll want to consider the guitar’s body style, neck, tonewood, electronics, and so much more. Below, you will find an explanation of some of these factors and more. Above, you learned about the various body styles. When choosing a guitar, you should consider the sound that it will produce and the guitar’s size. If you intend to travel frequently, you may want to invest in a smaller guitar, which will be easy to transport from one location to the next. The body style will help to determine the guitar’s tonal emphasis and sound projection. Be sure to choose a guitar that suits your body style and arm length. The guitar should rest comfortably in your hands and it should be easy to play. Another thing to consider is the neck of the guitar. The width and thickness of the neck can vary based on the overall size of the body. Acoustic guitars can come with 12 or 14-fret necks. Remember that this accounts for the number of frets clear of the body. It doesn’t mean all of the frets. When attempting to choose the right neck, you should consider the size of your hand. Choose a neck that best accommodates the size of your hand. This ensures that playing the guitar will be easy and comfortable. While you’re at it, you’ll want to think about electronics. Many people just want a conventional acoustic guitar without any electronics. This is often best for beginners. A totally acoustic guitar will save you money and still allow you to learn how to play. Once you’ve improved your skills, you may want to take advantage of electronics, such as tuners, piezo pickups or a preamplifier. Consider all of your options. There is a good chance that you’ll feel the need to choose an acoustic guitar with some electronics. Or, you may feel that the best acoustic-electric guitar is right for you. There is a good chance that you’ll want to record your music or play live in the future. If so, you’ll want to make sure that the intonation is perfect. This determines whether or not the notes will remain in tune as you move up the neck. The guitar will not be capable of playing in tune if the distance between the frets is off. Always pay close attention to the intonation to ensure that your guitar sounds great and is suitable for live performances. The wood choice is vitally important, because it determines the sound produced. Each wood will produce a unique tone. Most guitar makes agree that the top portion of the guitar is the most vital for determining the overall tonal quality. Spruce tends to be the most common. If you opt for a less common tonewood, there is a good chance that you’re going to spend more. Rosewood is very popular, but costly. Most people will be fine with a guitar made from Sitka spruce. If you’ve got a little extra money to spend though, you should not hesitate to upgrade to something a little pricier. The tuning machine is immensely important. This is what makes it possible to precisely tune and hold pitch. An enclosed machine head is best. This helps to prevent rust and airborne corrosives from harming the machine. They also do not require much maintenance. Guitars are pretty durable and they do not experience too many problems. Nevertheless, you’ll want to make sure that your guitar is going to last and that your money has been well spent. This is why you should choose a guitar with a great warranty. The warranties available really vary significant from one manufacturer to the next. With this in mind, you should shop around as much as possible. Choose a lengthy warranty to protect your investment. There is nothing quite more rewarding than learning to master the guitar. However, that is until you truly master playing the guitar in style. And, that is exactly what you can do with the Taylor 214ce Deluxe Grand Auditorium Guitar. This guitar is constructed with the same beauty and precision tone that Taylor Company has become known for over the years. However, if you are familiar with the Taylor Company, you already know that their quality comes with a price tag to match it. Fortunately, that is not the case with the 214ce edition. In addition to being affordable, this beautiful acoustic/electric guitar comes packed with a variety of other features that any player could benefit from. If you are an acoustic guitar lover, you already know that it doesn’t take much to ding them up. One little bump and you could be dealing with a dented body that would put a crimp in anybody’s playing style. Fortunately, that is something you don’t have to worry about when you invest in the Taylor 214ce Deluxe Grand Auditorium Guitar. Thanks to the solid Sitka spruce top, layered rosewood back, and sides, this guitar is capable the utmost durability. When you combine this with the beautiful and easy to play ebony fretboard, you are truly looking at the only quality-handcrafted guitar. Keep in mind that this guitar does not contain high-pressure laminate. It is, in fact, all real wood. The guitar is constructed with a layer of rosewood, a piece of poplar in the middle, and a final layer of rosewood on the bottom. All three layers are glued together under pressure to provide even more durability. Along with this, the back of the guitar has a bowl shape, which adds even more strength to the overall design. What’s the point of having all those frets on a guitar if you can’t access them? You probably know that most acoustic guitars don’t come with a cutaway, which denies you access to the last few frets. Fortunately, that isn’t the case with the Taylor 214ce Deluxe Grand Auditorium Guitar. In fact, this guitar comes equipped with a 16-inch cutaway, so you can literally access the entire length of the fretboard. You will be able to scale up and down the neck just like your favorite guitar gods. Acoustic guitars are great. They look amazing and sound great, but sometimes they just don’t provide the sound projection that you need in a big arena or auditorium. 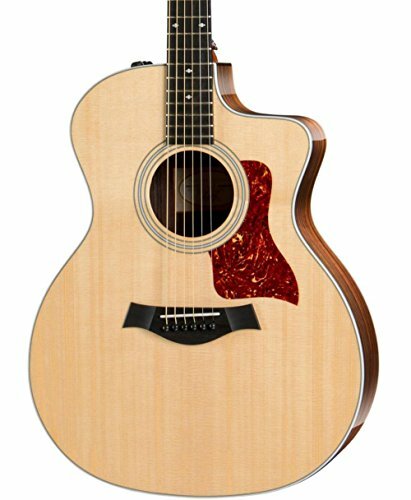 And, that is why the Taylor 214ce comes backed with electric playability. Whether you want to shock and awe a group of friends in front of the campfire or you want to rock out in front of hundreds, you truly have the option of doing so with this amazingly crafted guitar. Whether you want to hook directly into an amp or a microphone port on your computer, you will have the option of doing so. Along with excellent tone and beauty, when you purchase this amazing piece of equipment, you will also receive a Taylor gig bag. This amazing bag will protect your beautiful instrument anytime you are on the road or if you are just storing the guitar at home. This is not just any ordinary storage bag either. It is a deluxe hard case that is lined with incredibly soft velvet. As a long-time guitar player, you probably already know that tuning your guitar is a daily process. While the process is fairly pain-free and only takes a few minutes, these are a few minutes that you could be jamming out or learning a new chord. Not to mention, that constant tuning wears down the components over time. This is why the Taylor 214ce Deluxe Grand Auditorium Guitar comes equipped with a quality system that allows the guitar to stay in tune for a longer period of time. Not only will this save you time, but also it will prevent overall wear and tear on some of the main components of the guitar. This could be an excellent feature for new players, as tuning without a tuner can seem impossible. 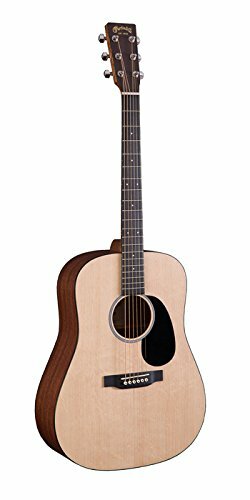 If you are looking for a lovely instrument that is backed by an amazing tone, you need to consider investing in the Taylor 214ce Deluxe Grand Auditorium Guitar. And, with its ability to stay in tune for longer periods of time, you will spend more time playing and learning, not tuning and adjusting. Whether you are just starting to learn guitar or have been playing for twenty years, there is a good chance that you have heard of the Fender Company. Over the years, this brand has created thousands of quality instruments that are utilized by millions of musical professionals all around the world. The company has become highly known for their innovative designs and quality-constructed instruments. Well, it is safe to say that those same principals and qualities went into the construction of the Fender T-Bucket 400 Acoustic Electric Guitar. This is one amazing guitar that sounds just as good as it looks. And, it is even affordable for the average player. However, affordability and good tone are not the only things that this amazing instrument has to offer. If you are familiar with most acoustic guitars, you know that due to their body designs it is almost impossible to utilize all the frets. What’s the point of having all those frets if you cannot play on them? Well, the Fender Company feels the same way and that is why this amazing instrument comes equipped with a cutaway dreadnought. This allows you to access and play all twenty frets. You can truly hit the highest of high notes and rock out like your favorite players. Thanks to this neat little feature you can literally scale all the way up and down the neck of the guitar. Most acoustic guitars are great from playing in front of small crowds or around a campfire. However, when it comes to playing in an arena in front of a large crowd, it can be hard to produce the sound that you need to be heard. Fortunately, that is not the case with Fender T-Bucket 400. Thanks to the Fishman Isys III pickup system and active preamp, you can truly be heard amongst some of the largest crowds. While active pickups do require a battery, they do come with the built-in ability to produce a certain amount of gain. In addition to all of this, the guitar also comes equipped with a tuner control, volume control, and tone controls, so you can literally make all the adjustments that you would ever need to right on the side of the guitar. This not only gives your complete control, but it allows you to truly customize your sounds for specific situations. Have you always wanted to learn to play the guitar, but just never knew where to begin? Maybe you were to embarrassed or shy to take lessons in person. Whatever the situation is, it won’t really matter when you invest in this amazing instrument. Upon purchasing this guitar, you will also receive six months of free digital online lessons. By the end of these lessons, you will know everything from the basics to how to play some of the simplest songs and chords out there. This will be a great starting point to get you on the road to mastering the guitar. If you are familiar with acoustic guitars, you already know that their strings are thicker, harder to hold down and most of the necks are hard to scale up and down, due to their designs. Well, with the bound maple neck on the Fender T-Bucket 400 Acoustic Electric Guitar this is something that you will never have to worry about. Not only is the neck easier to play up and down, but also it will produce a sound that cannot be matched be any other acoustic on the market. Anytime you invest in an acoustic guitar, you can always expect to get some dents and dings over time, as most of them are incredibly susceptible due to their all-wood designs. Fortunately, this is something that you won’t have to worry about when you invest in the Fender T-Bucket 400 Acoustic Electric Guitar. Thanks to the premium-grade laminated maple top this guitar will provide all the durability that you ever need, while providing a shiny and amazing look at the same time. In addition to this, the maple top comes equipped with a quarter sawn scalloped “X”-bracing, which provides even more durability to the overall construction of the guitar. For many new players, tuning a guitar can almost seem like an impossible task. Of course, manufactures make tuners for this very task, but what true player wants to use a tuner? Most guitars that are played on a daily basis will require tuning before each use, which will be a nightmare for newer players. Well, with the Fender T-Bucket 400 this is something that you will not have to worry about. Of course, you will have to tune the guitar from time to time, but thanks to its innovative neck and tuning system, this guitar has the ability to stay in tune for an extended period of time. You can literally spend less time tuning and adjusting and more time playing. If you are a new player, you may not realize the impact that a nut and saddle system can have on your overall sound. Most guitars just come equipped with a standard nut and saddle system, which can be later upgraded. Of course, there is nothing wrong with these standard systems, but they just do not produce the tone that most professionals are looking for. Fender completely understands this and that is why they automatically included a Graphtec NuBone Nut and Compensated saddle system on their guitar. This system delivers a rich tone with crystal clear highs and open lows, while increasing the harmonic content and sustain at the same time. If you love the sound of the acoustic guitar, but want the ability to be heard in front of hundreds of individuals, you need to consider investing in the Fender T-Bucket 400 Acoustic Electric Guitar. With its innovative onboard active pickups, you can truly be heard amongst some of the largest crowds. If you have the cash to invest in an acoustic-electric guitar, you should look no further than the Martin DRS2. This guitar is designed to offer the necessities for both experienced and accomplished players. This is by far one of the best acoustic-electric guitars on the market, so its price tag is slightly higher than other brands. However, if you want to invest in a brand that offers longevity and delivers a heavy bass sound, look no further than the DRS2. The Martin DRS2 is a dreadnought guitar, which means its body is boxier and bigger than the classical guitar. For players with short arms, the dreadnought guitar will not be comfortable to hold. Also, it may not be suitable for all beginners, since inexperienced players tend to tip their guitar forward, so they can see their fingers. In addition to the boxier, bigger body shape, the Martin DRS2 Dreadnought Guitar has a top constructed from Sitka spruce. This wood not only ensures elasticity but also strength, which when combined together yields crisp articulation and a broad dynamic range. This just happens to be one of the most popular woods utilized to construct guitar tops and soundboards. In addition to the solid Sitka spruce top, the Martin DRS2 is designed with back and sides constructed out of solid Sapele. This hardwood is not only resistant to wear and denting, but also beautiful in appearance. In fact, it is often utilized indoors, exterior siding and flooring, which says everything about its durability. A lot of acoustic-electric guitars come with a jack, which is offset. This is not the case with this guitar. The jack is located on the end pin, which is near the location where the strap attaches. This is undoubtedly more convenient than the alternative. When the guitar is plugged up, you never have to worry about the cord getting in your way. The jack works exceptionally well and holds the cord in place securely. It won’t fall out until you want it to. The Martin DRS2 features a 20-fret fingerboard constructed from richlite, a material made from phenolic resin and paper. This is an FSC certified product that offers a broad array of benefits, including scratch and heat resistance. The end result is superior comfort and playability. The included hardshell case will eliminate the need to make an additional purchase. The case is lined with a material that will offer a soft cushioning for the guitar when it is not in use. While the hardshell exterior is capable of preventing major damage, in the event of an accident, the interior lining will protect the guitar from scratches and scuffs. The DRS2 is one of Martin’s most affordable guitars, but it is no less appealing or playable. In fact, it is designed to deliver a rich, deep bass that will be music to your ears. It is also backed by Martin’s lifetime warranty to give customers peace of mind in knowing they are protected from potential financial loss related to malfunctions and manufacturing errors. Have you been contemplating learning to play the guitar? Maybe the only thing holding you back is the fact that you don’t want to spend a lot of money on something that you don’t know anything about. Well, what if you could get a guitar and all the accessories that you need to get started playing right away for an extremely affordable price? Now, you can with the amazing Ibanez – IJV50 – Acoustic Jampack. 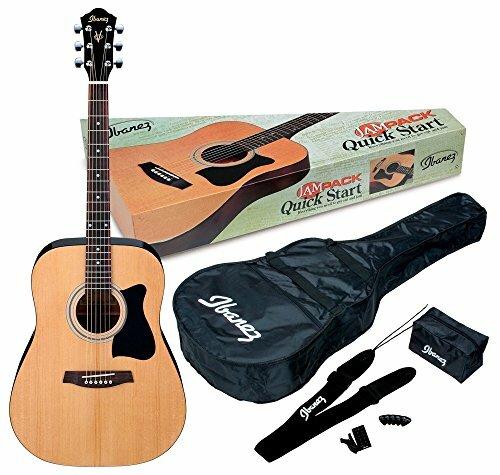 This starter pack not only comes with a beautifully crafted guitar, but it comes will all the accessories that any beginner would ever need. Most people are hesitant about buying acoustic guitars because they can be dented and dinged up so easily due to their all-wood designs. This is especially true when it comes to beginners because they don’t even know how to properly hold a guitar most times. Thanks to the beautiful spruce top installed on this amazing instrument this is something that you won’t have to concern yourself with. While it wouldn’t be advisable to be careless with this guitar, it is capable of withstanding some pretty harsh punishment. Not only does the naturally finished spruce top provide durability and a beautiful look, but it also produces a fantastic tone that can’t be matched by any other beginner guitar out there. Learning to tune a guitar is almost if just not as hard as learning to play. In fact, some individuals have completely given up on playing altogether, because they couldn’t get their guitar in tune. In addition to this, most guitars usually need to be tuned before every session to make sure that you are getting the best possible sound. The Ibanez Company understands the difficulty of tuning and that is why they have included a free electric tuner in this amazing kit. All you have to do is turn the tuner on, lay it on the guitar, strike the chord, and tune until you reach the desired key. The tuner will tell you what key you are in and if you need to tune up or down the reach another key. This makes the process bearable and completely possible for any beginner. Are you heading over to a friend’s house for some lessons or are you just storing the guitar in a closet at the end of your session? Well, both of these situations could put your new guitar in risk of being damaged. And, that is why this package comes with a gig bag. This bag is perfect for traveling or storage purposes. While this is just a bag, not a hard case, it will still ensure that your guitar is protected at all times. This beautiful acoustic guitar is extremely lightweight, as it only weighs in at six pounds. This feature will provide any player with more comfort, as he or she partakes in longer sessions and it also makes transportation easier than ever. However, do not be fooled by the lightweight design, because this guitar is extremely durable and capable of standing up to the test of time. As mentioned above, tuning your guitar is probably a task that you will be performing on a daily basis. While the process will get easier and easier over time, it can eventually wear out certain components like the tuners and the strings. This is why the Ibanez Company included chrome tuners on their Ibanez IJV50. Not only does the chrome give off a beautiful and stylish look, but also it provides the durability that you need for daily tuning. Another feature that cannot be overlooked on the Ibanez IJV50 is the rosewood fretboard. You will probably notice that more expensive guitars come equipped with an ebony fretboard, but the rosewood looks great and it is actually more resonant. This means that it is capable of producing a better sound than the ebony designed fretboards. If you have been thinking about learning to play the guitar, but have been bound by your budget, look no further than the, Ibanez IJV50. This guitar not only comes equipped with everything that any beginner would need, but it looks amazing and sounds great. Are you looking for the overall best acoustic bass guitar for your money? If so, you definitely need to check out the Ibanez 4-String Acoustic Bass Guitar. This guitar is pretty impressive and it’ll deliver great sound. No matter what genre of music you intend to play, you can guarantee that this bass guitar will do the trick. On top of that, the guitar looks amazing. The gorgeous finish will undoubtedly receive a lot of compliments from your friends and family members. Additional details about this guitar can be found below. First and foremost, you should know that this bass guitar is gorgeous. There are few other guitars that look this great. The mahogany finish looks amazing and it is also very durable. You can guarantee that this bass guitar will maintain its beautiful appearance for many years to come. Another great thing about this guitar is the rosewood fretboard. The guitar includes 20 frets in all and the board itself is incredibly tough. Even if you play this bass guitar with maximum intensity, you can guarantee that it’ll last. It should also be known that this guitar is equipped with a very reliable tortoiseshell tuning machine. This machine works exceptionally well and it is definitely capable of holding a tune. Despite being fairly affordable, this guitar is equipped with many excellent features, including an onboard tuner and a ¼” output jack. This combination ensures that you’ll be able to use this guitar to create any type of music that you prefer. Whether you’re a fan of rock or country, you can guarantee that this guitar will suit your needs. Plus, the bass sound produced is stunning. Just remember that this guitar uses a 9-volt battery. When it comes down to it, the wood used to make the guitar can make a huge difference. Thankfully, Ibanez knocked it out of the park in this category. The company made use to use the highest quality wood for this particular guitar. The combination of maple and rosewood is spectacular. You can guarantee that your Ibanez Acoustic Bass Guitar will sound great and look amazing for many years to come. If you’re worried about appearance and sound, you cannot lose with this Ibanez guitar. Despite being very well made, this guitar is pretty lightweight. You don’t have to be a brute to lift it up. And, you never have to worry about it leaving a lasting impression on your legs. Its lightweight design ensures that it’ll rest comfortably in your lap for the entire playing session. Plus, moving the guitar from one place to another couldn’t be easier. Truly, there is a lot to like about the Ibanez 4-String Acoustic Bass Guitar. 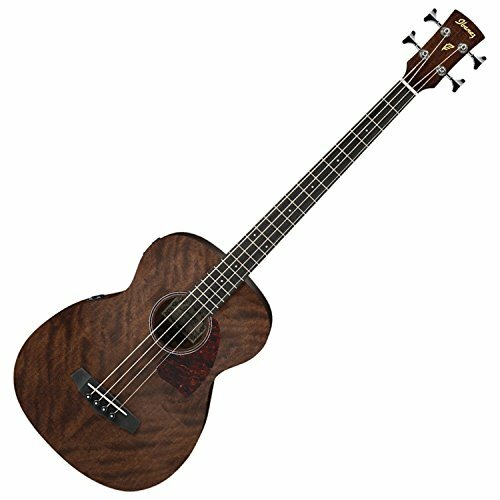 In fact, it is likely the best acoustic bass guitar for those that do not want to break the bank. The guitar produces a great sound, but it is slightly low without an amp. While the guitar is great for beginners, it is also more than capable of satisfying veteran players as well. Regardless of your music genre of choice, this guitar will satisfy. Just remember to buy a separate set of things and you’ll be good to go.